A homestead can always use another source of income. So when you are ready to search for a new source of money, an animal that is easy to care for and an all-around producer is the perfect choice. Geese are great little pets, cook into a good meat, and the eggs can be used in a variety of ways. Each one produces an income and this bird is a tasty treat at any time of the year. If you haven’t had much experience with a goose, you are in for a treat. They can be amusing to watch and can be trained to attack friends and family to your amusement. 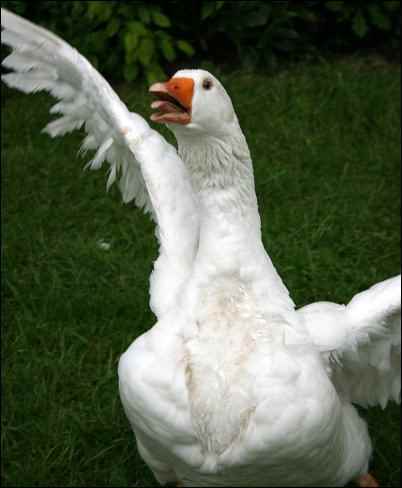 A goose’s personality is just plain fun and you will find yourself laughing a lot as you spend time watching them. Start with a few large geese in the yard. They will begin to lay eggs right away. As each egg drops you can assume your income is on its way. You can let them free range or place them in a yard surrounded with a six-foot chicken-wire fence. 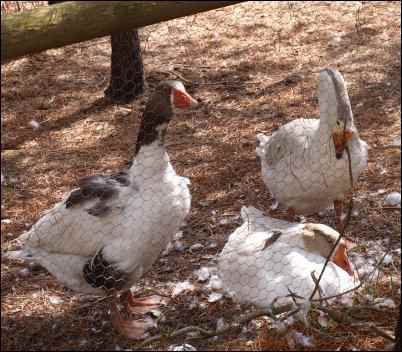 If you are going to be hatching out the eggs then cover the top with chicken wire too, because other predator birds love the baby goslings for food. Hawks can make off with a baby gosling before the mother goose can turn around, so protect the babies if you are going to hatch eggs. They will lay and hatch anywhere from three to five eggs at a time. If you have a dirt yard or pen, they will scoop out a shallow hole and lay the eggs right there. Geese begin by setting on the eggs at night, so do not worry if you do not see them sitting on the eggs during the day time. As the time gets near to hatching they will sit on the eggs all the time. 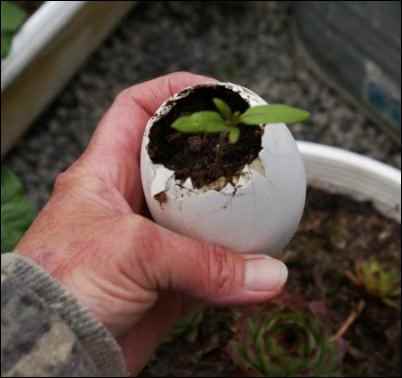 It takes four weeks for an egg to hatch out. You get one gosling per egg. One goose can produce four to six goslings each month, so be careful if you have very many geese. Make sure you have outlets for sales before you begin this business. If an egg does not hatch out, it is likely to be a spoiled egg and will smell terrible when broke open. Just dispose of these eggs. You cannot save the shell and you will not want to be anywhere near it once it is opened. So be prepared and do not throw up your lunch. Goslings will sale for $3.00 a piece and up. With three to five geese this will make a pretty good second income for your homestead. They are cute as can be when they hatch out, but this is not the time to try to pick them so you can admire their soft little bodies. The goslings can hatch yellow, white, blue and other colors, but the color will change to normal goose markings as they grow older. Do not have hope that your little blue gosling will grow into a big blue goose. It will not. A good size goose is ready to slaughter and cook when it reaches about 15 to 30 pounds. Feed them good food and all the scraps you can find. They are really fond of cereal of any kind, dog food, and other garbage-food. Add a little molasses to their food to fatten them quickly. They cook up just like a turkey and are just as easy, but plan for a longer cooking time because of their size. It will take longer to cook than a turkey and require a bigger pan. Be sure you slaughter the goose for cooking before it is too big to fit in your oven. Because of their great taste, you can sell your geese butchered or un-butchered near any holiday season. However, they are great any time of the year for all different events. They make a great bird for large summer cookouts or family reunions because one goose will feed a large number of people. When you sell the geese as food, charge at least an extra $10.00 if you have to butcher it for the customer. If you have to do the dirty work, you should be paid for it. Save the downy feathers. They are great to sell as individual pieces for crafters. They are used to stuff pillows, quilts, create earrings, and other jewelry or leather and feather crafts. It takes a lot to make a pound, so sale them by the baggie or individually. Be sure to clean the feathers well and spread to dry before selling. No one wants to deal with a poopy, bloody, dead goose smelling feather. They want their feathers clean and ready to use. Geese stick together as a group to protect the babies or any eggs waiting to hatch. They will attack you with wings spread and mouth open and their beaks can deliver a mighty pinch! 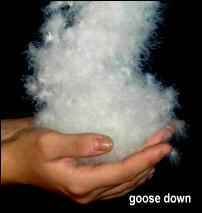 You know what it is to get goosed? Well, they are the reason for the phrase, and they will goose you when your back in turned with a pinch to the backside. Be ready for anyone watching to laugh for the next few hours of you running from an angry goose. If you plan to sell the eggs, there are a few ways to create an income from each different use. Sell fresh eggs for food, sell laying eggs to other homesteaders with chickens or geese that can sit on the eggs to finish the hatching. Or provide empty, clean shells for crafters. Goose eggs are traditionally used for Ukrainian art eggs and you can sell empty, clean eggs for as much as $5.00 each. You can provide an extra polish to the eggs by using a very light sandpaper on the outside of the empty egg shell before selling it to your customer. Fresh eggs for food are good tasting and work in any kind of cooking. Just remember that a goose egg is a lot larger than a chicken egg. One goose egg is equal to about four large chicken eggs, so one goose egg can make an omelet. For a great omelet, mix up the eggs just the way you would chicken eggs, but use a little more liquid filler such as milk. It will soften the flavor of the egg and make the omelet fluffy. Add all the same ingredients and find someone to share it with, because it is going to be a big omelet! It makes for an economical efficient meal on the farm or homestead when company shows up for the weekend. They will love it or they will bring groceries the next time that suits their taste so you do not have use your own food. The eggs can be used in baked goods and will result in great foods. They give a rich flavor to cakes, pies, cookies, and other baked goods. They make a good custard and are really easy to use. Crack one egg into a plastic dish and gently mix. If you want to make an impression on a visiting child, use goose eggs for everything you cook. It will delight and amuse them for years to come. Use the egg according to how much you need for the recipe. You can cover the rest of the egg and use it later over the next couple of days. 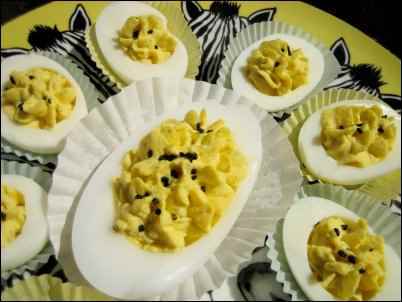 I like to use a combination of chicken eggs and goose eggs to make deviled eggs for family reunions and a holiday get together. It is a lot of fun to watch the faces of the guest as they take their first look at your combination deviled eggs. Children are usually the first to go for a deviled goose egg. They are large enough to be the amusing center in a luncheon salad and you can flavor them just like chicken eggs. Place a goose egg in boiling water for 10 minutes, after that remove the pan from heat and let it set for another 10 to 15 minutes before removing the shell. You may have to adjust the cooking time according to the altitude at which you are cooking. Sometimes you just have to experiment a few times before you find the perfect cooking time. Hard-boiled goose eggs are fun to bring out at any picnic. Do not forget the salt and pepper for flavor. This is one egg you may have to share with everyone. Provide a selection of dips for your portion of the egg like ranch, thousand island or just plain mayonnaise. Try slicing the egg and serving it on each plate and let everyone guess the size of the chicken this one came from. It will make a great competition for the best liar (storyteller) of the day. Tell them you have to keep a shotgun handy for the wild chicken that laid this egg, because it weighs well over 100 pounds and has eaten two cars. You can be sure of an invite to the next picnic as your guest wonder what you will come up with the next time. If you want to use the shells for craft projects or to sell, poke a small hole in each end of the eggs. 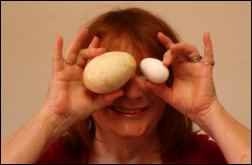 You are going to take a big breath of air and gently blow the inside of the egg from one end out the other into a bowl. The egg is still good to cook with, but now you have one clean shell. Be sure and rinse your mouth out each time before moving on to the next step. It is for health and safety reason regarding raw eggs. Rinse the shell thoroughly with warm water and wipe it clean. You can place the shell on a window ledge in the sun and let it air dry inside and out. Clean the outside of the egg until it is free of all dirt and makes before selling. If you need to you can use a very fine sand paper to smooth and polish the outside of the shell. A clean egg brings a much better price. Rinse the shell thoroughly with warm water and wipe it clean. You can place the shell on a window ledge in the sun and let it air dry inside and out. Clean the outside of the egg until it is free of all dirt and makes before selling. If you need to you can use a very fine sand paper to smooth and polish the outside of the shell. A clean egg brings a much better price. 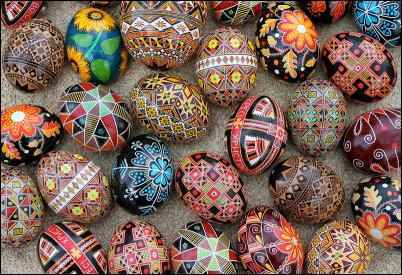 Now I do not have the talent of a Ukraine artist, but I love to paint the egg shells with different designs or add lace and rhinestones for Christmas ornaments. Kids love to make ornaments with goose egg shells because of the size and they are pretty sturdy for little hands. Use simple paints or trims to create a beautiful ornament for your holiday tree or for kitchen decorations. You can use a nail file to very gently cut away the front portion of the egg and create a lovely scene of some type inside the shell. If you love to work with miniatures this is a great project. If the egg breaks in half, then clean out the shell and create your artwork inside. You can create it as a scene looking in the front of the shell or as a nest type of medium by adding items to flow over the shell. They also make a great place to start plants. If you want to do something to support the community provide enough clean shells to a class of children to create art work for the holiday season. They can use the shells to make gifts for their family in hard times when money is not available. Do not forget to add feathers to your donation for art work. The goose has many uses, including teaching children how to provide for themselves and use everything in a positive way for the future and the environment. 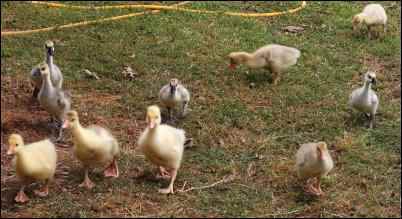 There are not too many down sides to owning geese, except maybe you need to clean the yard and you will have to do that pretty often. When you hear about someone squirting like a goose, you will know what it means the first time you see one do its doody in the yard! Every part of this project can become an income. It is fun and the geese are a tasty treat any time of the year. Check out http://roastgoose.com for information regarding ordering a fully cooked goose or keeping up with the price of clean, empty shells. Have fun and never turn your back on this business or the goose gets the last laugh.